When I was first told that the museum was going to have a blog site, I thought – ‘Oh great! Now everyone who wants to know what I ate for lunch every day will have access to that sort of information.’ Then, Erin told me it won’t be the sort of blog site where everyone can find out what I ate for lunch on a given day, but a way of letting people know more than the credentials listed on my museum webpage. So when trying to decide what to write about, I figured – why not put some of those old camp diaries that are just collecting dust at home to good use? So here is my first attempt. 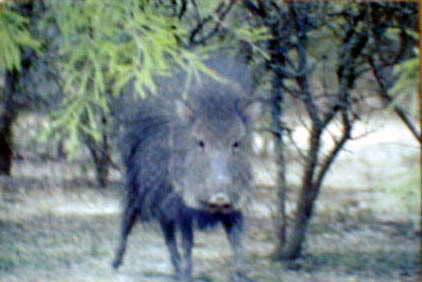 For some background, I spent 1989-1990 studying a semi-captive baited herd of Chacoan peccaries (Catagonus wagneri), an endangered, medium-sized mammal endemic to the Chaco biome of central South America; Taguá is the Guaraní Indian word for this distant relative of the pig sub-Order. They are extremely rare, and very few people ever see a live one in the wild. Writing this piece takes me back to a time when I accomplished a lot by knowing very little. Only in my early twenties, I did a lot of growing up during my stint in the Chaco – hot water, electricity, air-conditioning, phones, TVs, stereos, etc. were non-existent in my life, but the fauna was diverse and abundant, and the studies I was able to accomplish during my time there paved way for a lifetime of disciplined work. I hope everyone out there in cyberspace enjoys reading this. At 08:34 hrs, this dude saw WILD TAGUÁ!!!! I cannot describe the sensation of witnessing them in all their glory. Even the folks studying population dynamics of this species have never stumbled upon them in the wild – tracks yes, and the individuals that the indian’s dogs ‘cornered’ in order to radio-collar maybe five times. Even my counterpart Jak, who was born and raised in the Chaco, and has spent much of his whole life in the wilderness has barely seen wild Taguá! The thing that kills me is they are right in ‘my own backyard’! I saw them on Gabor’s land between his Estancia and house lot, on the south side of the dirt road. There were two individuals at least in their second year with a ~2 month old baby [very cool that these rare species were breeding, sustaining, etc.]!!! I totally enjoyed your entry, and really identify with how much we can know when we allow ourselves to know nothing, or when we don’t even know that we require that kind of allowance at all. A friend was recently in berlin and told me that wild boars come into the city as their habitat is in decline. I wonder if the new millennium will see more and more species making themselves visible simply because we go where they are? Meanwhile back in the states, I imagine I stumbled across some indigineous natives setting fire to explosives, possibly upside down in the gas tank of their lawnmower. Because that’s what people do on New Year’s. Boy, you really missed out that year! Great story. I had forgotten some of the details. We drilled a well in the Chaco back in the 80’s, a dry hole. The geologist that sold the propect told me later that he didn’t think it was a good risk at the time! I said “why didn’t you say that when we were deciding what to do?” He replied that I overpowered him and he thought I wanted to do it eventhough it was a sorry prospect. Moral: if you hold sway over people make sure you give them room to speak freely and make them feel comfortable to tell you truthfully what they believe. I guess I was just an overbearing A__ H__e. You in contrast are a dedicated scientist and a nice guy. Good blog,memorable experience for you! Nice story. Even better than finding black bears in Arizona (if you recall that trip)! Great Story… Keep the blogs coming! Mean while back at the ranch and fast forward to 2002(?). Remember the trip to the deep and dark upper reaches of Buffalo Bayou. The lake of trees, pipeline ROW rivers, Yellow-crowned night heron rookery and navigation by gunfire. Keep up the a posts. I bet you have a treasure trove of journals. The catagonus looks like our javelina. I never understood people shooting javelina – horrible table fare.